The LTE iPhone 5 with a 4-inch screen, iOS 6, iTunes updates, new iPods, and headphones were all announced today. Shortcuts: iPhone 5, iOS 6, iTunes, iPod Nano and Touch, EarPods. What you missed: Not much that you didn’t already know about if you’ve been following Apple news and rumors lately. Yes, there is an iPhone 5 coming out on September 21, but the improvements are incremental. If you need a new phone, great–but there is nothing in this new device that screams for an upgrade unless you are an LTE speed-freak or a photo nut. The updates to iOS 6 were mostly covered at Apple’s WWDC event in June. The much-needed iTunes overhaul is a streamlining of the best features that already exist. 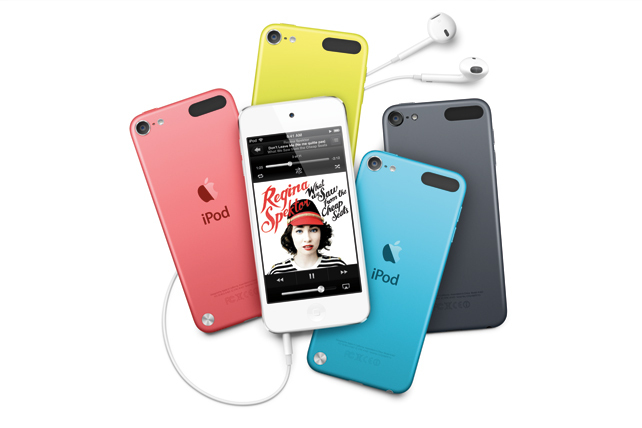 While a colorful new set of iPod Nano and iPod Touch devices is welcome–Apple sold more than 36 million of them over the past four quarters–none of the features are enough to make me want to chuck the three versions of iPod that I already own. It’s hard to evaluate those EarPod headphones without doing an earwax-on test, but the packaging makes them look like fallopian tubes. Still, there’s new hope for those with ears that weren’t designed by Apple–for many of us, the old buds never lined up properly and fell out constantly. Apple CEO Tim Cook kicked off today’s event with the now-customary look at Apple’s stellar numbers–everything from sales to app downloads. “The iPad accounts for 91% of the web traffic of all tablets. Now, I don’t know what these other tablets are doing,” Cook said. “They must be in warehouses and store shelves or maybe in some people’s bottom drawers.” iGetit. Pricing: With a two-year contract, the iPhone 5 will cost $199 for 16GB, $299 for 32GB, and $399 for 64GB. Pre-orders start on September 14. And the iPhone 5 will be available starting September 21. The screen is now 4-inches wide (up from 3.5 inches in the current model). As predicted, the display has been improved to 326 ppi with 1136 x 640 resolution. To put this in perspective, HTC already makes a phone with better resolution (not that you’d want to buy it), but this is still impressive: There are low-end desktop monitors with nearly the same specs. And in the case of many apps that developers will have to update to meet the screen size, Apple is filling that extra .5 inch of space with black bars, like a standard-def cable show on your HDTV. Yes, the iPhone 5 will include LTE for superfast wireless connectivity (assuming you can find it reliably working in your city). Apple is working with Sprint, Verizon, AT&T for LTE in the U.S. And Rogers, Telus, Bell, in Canada. You’ll also get improved Wi-Fi: New Wi-Fi, 2.4GHz and 5GHz on 802.11n. And a new A6 chip will make the phone run twice as fast and Temple Run look twice as rad. Game Center now has a time-shifting mode that lets you race today and have your friend race against you tomorrow (this has been available on consoles, but it’s the first time I’ve seen it on a mobile device). The iPhone 5 battery life is now up to 225 hours in standby, and Schiller is promising 8 hours of LTE browsing and 3G talk time. The camera, which is now being called iSight Camera, has not only become smaller, but faster and more powerful. It’s got an 8 megapixel sensor, backside illumination, five-element lens, and f/2.4 aperture. There’s a dynamic low light mode, and the lens uses some kind of sapphire crystal that Schiller is raving about (it makes the lens stronger and more scratch resistant). There’s also a built-in panorama mode (so long, Photosynth app! )–Schiller shows a picture of the Golden Gate Bridge from end to end that is 28 megapixels. There are more speakers on the phone, and improved audio. There are also three microphones, front, bottom, and back. I’ve heard of binaural recording, is there such a thing as trinaural sound? There is a new Lightning connector at the bottom of the iPhone 5. A whole generation of iPhone accessories just became a pain in the dongle. But it’s so small–80% smaller, and reversible–that you’ll want it even though you hate Apple for increasing the spaghetti in your cord drawer. And they’re already working on an adapter so that your old 30-pin docking gizmos can still be used (it will probably cost a pretty penny though). Most everything announced about iOS 6 was already introduced at Apple’s WWDC event in June. The new maps features, passbook for your ID cards, VIP email, sports scores… There are a few exceptions, course. iPhoto has been updated to include shared photo streams, for example. Eddy Cue takes the stage to announce some changes to iPod and iTunes. It’s been completely redesigned, including the App Store, with improved performance. And it appears to be optimized for mobile devices: “More than two-thirds of our downloads now come directly from iOS devices,” says Cue. Click on an album cover and the window splits, expanding to show the song tracks. Click on a song and it plays. “Dramatically simpler,” says Cue. Although so far these interfaces aren’t all that new. Managing playlists is easier. The store has been redesigned as well. These features will need to be used to be evaluated, and lots of reviewers will be doing just that when it gets released in October. The mini-player, which is the smaller version of iTunes that you get when you minimize the window, now includes a lot more functionality. You can manage playlists from there, for one thing. The movie library looks like a grid of movie posters now. Despite some build up suggesting otherwise, Cue did not introduce the rumored Pandora-like streaming radio feature … this time. There’s a new iPod Nano, and it looks like a teensy-weensy iPhone. It’s the thinnest music device Apple has ever created (5.4 mm), yet it’s also got a 2.5-inch multitouch screen. There’s a home button, just like on the iPhone, and a rocker control on the side for play/pause and forward/back (it looks like a metal version of the one that now exists on headsets). It features an integrated FM tuner, and Nike+ fitness app. Widescreen video is back. Bluetooth, by popular request, has been added. This will also use the Lightning connector, same as the iPhone 5. Scott Wilson created the TikTok. There are a bunch of round icons on the iPod Nano screen here that I’ve never seen before. It comes in colors everywhere, seven of them. iPod nano is $149 for 16GB and comes out in October. There’s a 5th generation iPod Touch. It’s also very thin (6.1 mm). It has the same 4-inch display as the iPhone 5. A faster chip than before, the A5–seven times faster. But with 40 hours of music playback time on a full battery, or 8 hours of video. And a new 5-megapixel iSight camera too. The video is 1080p, and the FaceTime camera is 720p. But no LTE wireless for sucking down all that data? You can now talk to Siri on an iPod Touch. Siri: What’s The Difference Between Invention And Innovation? Available in five colors. The 5th generation iPod touch is $299 for 32GB or $399 for 64GB and goes on sale in October. Apple headphones have been upgraded, and they will henceforth be referred to as EarPods. This is a major overhaul of the existing headphone design. It has a directed speaker that points into your ear canal (what, I can’t hear you?). The shape of the earbud is tailored to the geometry of your ear. Apple scanned hundreds of ears to figure out what they all had in common (including a lot of wax, hair). These EarPods will be included with the iPod Touch, Nano and iPhone 5, or you can buy them separately starting today. Then the Foo Fighters, the band fronted by the former drummer of the most anti-corporate band ever to grace a major label, Nirvana, floated onto stage and played “Times Like These” in front of a giant, glowing, corporate Apple logo to end the show. All in all, it was the best everything that Apple has ever made, according to the executives on stage. So if I am following along correctly, the Apple execs think all these new products are the best they’ve ever done. You don’t say?